TThe designations employed and the presentation of material in this publication do not imply the expression of any opinion whatsoever on the part of the Food and Agriculture Organization of the United Nations concerning the legal status of any country, territory, city or area or of its authorities, or concerning the delimitation of its frontiers or boundaries. The mention of specific companies or products of manufacturers, whether or not these have been patented, does not imply that that these have been endorsed or recommended by FAO in preference to others of a similar nature that are not mentioned. In the twelve years since the first Asia-Pacific Forestry Sector Outlook Study was completed in 1998, the region has experienced tremendous changes in nearly every aspect. These changes have been particularly profound in the forestry sector, where society has dramatically increased its demands and expanded its expecations of forests and forestry. 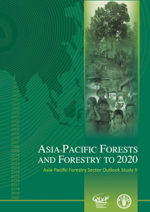 This publication summarizes the key findings and results of the second Asia-Pacific Forestry Sector Outlook Study - a comprehensive effort spanning nearly four years and involving all member countries of the Asia-Pacific Forestry Commission. The current report synthesizes observations and findings from almost 50 country and thematic reports in providing analyses of the status and trends of all aspects of Asia-Pacific Forestry. The publication also analyzes key factors driving changes in forestry in the region and sets out three scenarios for 2020: "Boom", "Bust" and "Green Economy". The report concludes by outlining priorities and strategies to move the region's forestry sector onto a more sustainable footing and to provide continued benefits to future generations.